Page 2 - What do the prime contenders of the EPL need to do to win season 2018-19? Mohamed Salah of Liverpool FC in action. Let's talk about Liverpool FC, who lead the league with 48 points having an advantage of total 4 points over the 2nd placed Manchester City. They have reached Christmas unbeaten after 18 matchdays. 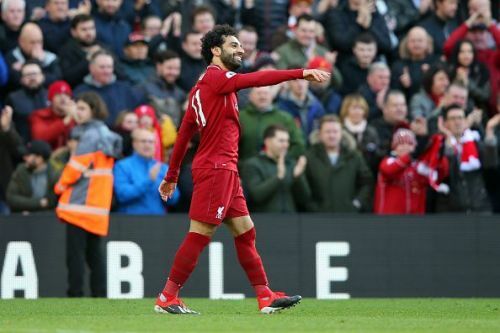 The best part about the team is that they play attacking football every single minute of the game and much of the credit should go to Jurgen Klopp. They look like a club built to win the Premier League and their first trophy in the Jurgen Klopp Era. They need to concentrate and pick up points against the smaller clubs. The thing that is to be noted though, is that this is not the first time they are the prime contenders. They were one of the favourites last season too, but couldn't topple Manchester City from the top. They have taken a 4 point lead this season and will hope to continue the season in similar fashion. Liverpool have not won the Premier League since 1990. They have been craving for the Premier League in the past decades after messing up their opportunity many times in the past years. So it would be interesting if Klopp can finally bring the title to Anfield. How likely is it for Liverpool to win the Premier League?